Catalina Island vacation offers fishing and relaxation for a fun California weekend getaway. There are many Catalina Island activities for your vacation. Most people arrive at Catalina Island by ferry boat. The Catalina Express offers ferry rides from Long Beach, San Pedro and Dana Point to the cities of Avalon and Two Harbors on the island. For discount tickets for the Catalina Express see arestravel Catalina Express. 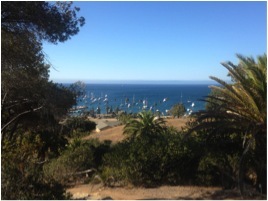 Check out the view from The Banning House at Two Harbors, Catalina. This cozy, Craftsman-style bed and breakfast was built in 1910 as a summer home for the pioneering Banning brothers. It offers amazing views of the Isthmus of Catalina and Catalina Harbor above Two Harbors. Two Harbors is truly island life without the hustle and bustle of shopping and retail. Be ready to enjoy a relaxing and somewhat more quiet version of Catalina. Keep in mind there are only twelve rooms when planning for your group. Each room is individually decorated and have a private bath. Some rooms accommodate up to four people. The entire facility can be reserved for special occasions. Home › Weekend Getaways › For discount tickets for the Catalina Express see arestravel Catalina Express.